I never had the opportunity to experience Disney World or Disneyland as a child, but like millions of children I was glued to the television set on Sunday nights to watch The Wonderful World of Disney. It was a special night when the show would feature the parks. I had a Viewmaster with reels of Disneyland and Disney World and I would look at those photos over and over again, imagining that some day I would visit those magical places. My first trip to Disney World was in 2000, and I was able to share that first time experience with my children. We have returned to “The Happiest Place on Earth” many times since then. 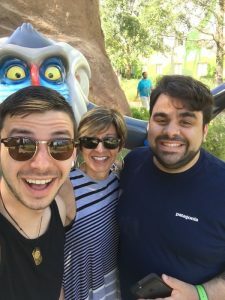 My sons are grown and still travel to Disney World with me! I have stayed all over “the world” and have visited at different times throughout the year, experiencing different special events. It truly isn’t just for kids! After retiring from teaching last year, I knew I wanted to use my powers of planning for good! I was given a wonderful opportunity to do something every day that I love, and I get to share that love. There is nothing like passing through that gate at the Magic Kingdom, and emerging on Main Street with Cinderella’s Castle in front of you, hearing the music and smelling those wonderful smells from Main Street Confectionary…oh, I want to be there now! Those trips hold many special memories for me and my family. I would love to share my experience to help make those special memories for you. © 2004-2018 Mouse Made Simple® Travel, LLC. All Rights Reserved.